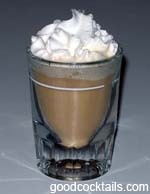 Pour the coffee liqueur and Irish cream into a shot glass. Add whipped cream on top. DO NOT USE YOUR HANDS TO TAKE THIS SHOT!